One thing I've always wanted to do that you could try for Halloween this year is to make your own little coven. Your daughters, nieces, and you can dress up as a bunch of witches for trick-or-treating! These Starlight Witch costumes are great for you and your kids! Come take a look at these enigmatic and magical costumes. They're also available on eBay. Isn't this purple hue perfect for the adult Starlight Witch costume? It's definitely alluring and a little ominous! You wouldn't be able to tell if it represents a good or bad witch. This may be the only time your daughter will be okay with having a matching outfit like her mom! This Starlight Witch child costume is almost identical to the adult outfit. The sleeves are a bit shorter and less elaborate than the adult witch! Wow! 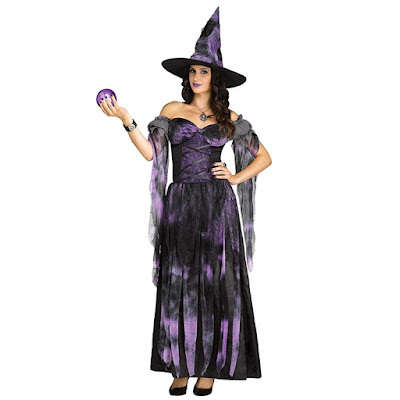 The sleeves on this women's plus size Starlight Witch costume are amazing! No one is being left out of your coven this year! Everyone can participate in your witch-a-thon. Of course, you don't need to exclusively wear these to create a clan of witches. I just think it's really cute to have matching outfits! Plus, I guarantee your kids will only match with you in circumstances like this. What do you think of these Starlight Witch costumes? Tell me about it down below!